A Kafka topic is spread across a Kafka cluster as a virtual group of one or more partitions. A single partition of a topic (topic partition) can be replicated across a Kafka cluster to one or more Kafka brokers. A topic partition has one partition leader node and zero or more replicas. Kafka producers publish messages to topic leaders as do Kafka consumers consume them from. Partition is an internal data structure that ReplicaManager uses to represent a TopicPartition (and manage all partitions). Partition is a KafkaMetricsGroup and registers performance metrics. 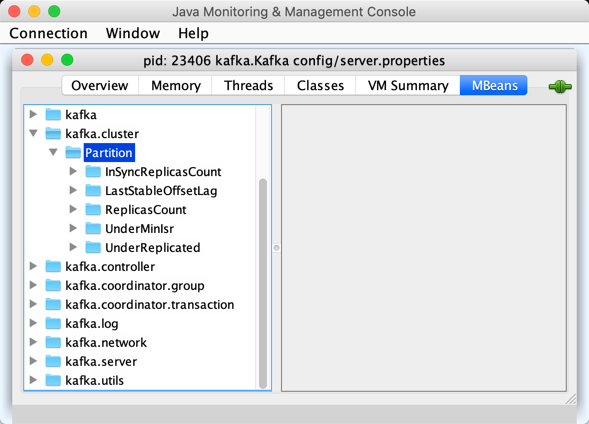 The performance metrics are registered in kafka.cluster:type=Partition group (only when the partition is not offline). Partition uses [Partition [topicPartition] broker=[localBrokerId]] as the logging prefix (aka logIdent). maybeExpandIsr is used exclusively when Partition is requested to updateReplicaLogReadResult. maybeShrinkIsr is used exclusively when ReplicaManager maybeShrinkIsr. updateReplicaLogReadResult is used exclusively when ReplicaManager updateFollowerLogReadResults. updateIsr is used when Partition is requested to expand or shrink the ISR. makeFollower is used exclusively when ReplicaManager is requested to makeFollowers. leaderReplicaIfLocal returns a Replica when the leaderReplicaIdOpt is the localBrokerId. Otherwise, leaderReplicaIfLocal returns None (i.e. undefined). Partition initializes the internal registries and counters. isUnderReplicated is true only if the partition isLeaderReplicaLocal and the number of in-sync replicas is below the assignedReplicas. isUnderMinIsr is true only if the partition isLeaderReplicaLocal and the number of in-sync replicas is below the min.insync.replicas configuration property (as configured for the Log of the leader replica). makeLeader is used exclusively when ReplicaManager is requested to makeLeaders. maybeCreateFutureReplica is used exclusively when ReplicaManager is requested to alterReplicaLogDirs. appendRecordsToLeader basically requests the Log (of the leader Replica) to appendAsLeader. doAppendRecordsToFollowerOrFutureReplica is used exclusively when Partition is requested to appendRecordsToFollowerOrFutureReplica. maybeReplaceCurrentWithFutureReplica is used exclusively when ReplicaAlterLogDirsThread is requested to processPartitionData. delete is used exclusively when ReplicaManager is requested to stopReplica. removeFutureLocalReplica is used when ReplicaManager is requested to alterReplicaLogDirs and handleLogDirFailure. isLeaderReplicaLocal is positive (true) when the optional Replica is defined. Otherwise, false. isLeaderReplicaLocal is used when ReplicaManager is requested for the performance metrics (InSyncReplicasCount and ReplicasCount), isUnderReplicated, and lowWatermarkIfLeader. apply is used exclusively when ReplicaManager is requested to add a TopicPartition to allPartitions. localReplica simply gets the partition replica for the local broker ID. getReplica returns the replica by the given replicaId (in the allReplicasMap registry) or None. toString is part of the java.lang.Object Contract for a string representation of the object.